Thursdays demo. Emotional and tiring. Thursday as you know is our weekly demonstration day. 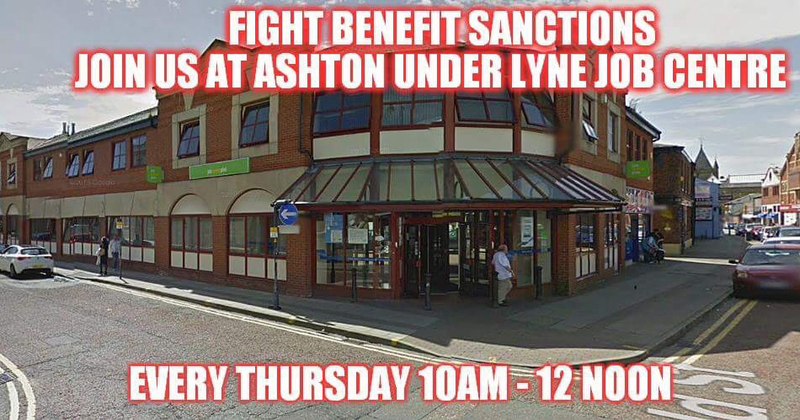 Every week for over two years we have been helping and advising claimants outside Ashton Under Lyne Jobcentre and if you scroll back you can read some of the heartbreaking stories that we have heard. Earlier this year we saw the need to hand food parcels out to claimants, its an idea that I wish we had started a long time ago. Its proven to be essential, and Ive no doubt that they have enabled claimants to keep going. When you are sanctioned or waiting for an ESA appeal to go through you become very hungry, and these food parcels contain some good nutritious food that is quickly and easily cooked. Many thanks to Pauline for helping us with these and to everyone else who has donated. We rely on your donations because I, myself am on such a low income that I’m struggling myself and the other campaigners are managing on limited incomes. Thursday was a cold day, and it reminded me that we are heading towards winter. Its cold on the streets and in homes that people can’t afford to heat. So we will have to start stocking up on hand warmers, gloves, fingerless gloves, hats and scarfs. I’m well aware that many people die through hypothermia as well as malnutrition and hunger. Here’s an example of the claimants that we helped. Remember this is only in the space of two hours. Claimant sanctioned but forced to go into the Jobcentre every day. They were using the library to do this but the DWP decided that they wanted to drag him in everyday. He was completing his job search correctly. Advice, support, solidarity and a food parcel given. Woman with a new born baby forced to go into the Jobcentre to show that she actually has a baby. The birth certificate isn’t good enough anymore and they like to remind you that they are there watching. And yes, she was already claiming and had applied for everything that she was entitled to. ESA claimant who was appealing their failed medical decision, told by their advisor that they have to claim JSA whilst awaiting their appeal decision. By doing this they are then declaring themselves fit for work, and the advisor is knowingly committing fraud. But they need money to live on and its a no win situation. The appeal rate was taken away in April therefore claimants are left with no choice but to claim it. Food parcel given. Universal credit claimant who had lost their job suffering from extreme anxiety due to the thought of having to go through the system again. They hate Universal Credit they feel that its taken their life away and any choices that they might have had. Food parcel given due to their income being that low that they cant afford to buy food and keep a house going at the same time. Awful. ESA claimant who failed their medical but have been refused the option of being able to claim JSA because they are too sick. They are left with no income at all and no hope. Food parcel given and signposted to other organisations locally. 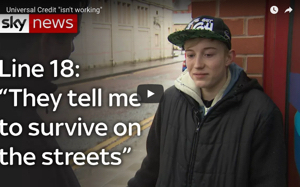 Young man sanctioned on Universal Credit. He was very quiet and I could see very depressed. He also has a girlfriend and baby at home. They get child benefit but everything else had been stopped. Advice given, a shoulder to cry on, signposted and two food parcels given. Poor lad, he’s so young and hes got no hope. The government has taken any hope that he might have had away. Two men that we have been helping for a few weeks now. They are living at the travel lodge. They have become part of the team, they are fantastic. We sorted out kettle cook food, due to them not being allowed to cook in the travel lodge. One of these men has been struggling to get his ESA payment as described in my previous blogs. But he had some good news. He might be getting somewhere permanent to live in the near future. Hopefully we will hear some good news regarding that next week. We saw quite a few older people having to use the Jobcentre, people that would have been retiring in the past. I find this very sad to see. How on earth will they be able to find a job? The jobs aren’t out there and this makes me angry. These are just a few of the issues that we had to deal with on Thursday. Its shocking but I shall continue to campaign for these people and help them. They need the help because the Jobcentre doesn’t offer them any advice nor do they signpost them. Many thanks to the new people who turned up to help. I really appreciate it. Its a tough job and its a full time job for myself. Campaigning doesn’t just stop outside the Jobcentre on Thursdays. It involves alot of work, meetings, research and everything else that goes along with that. I am ashamed to say that I am struggling at the moment and my morale was at an all time low this week. No money and Teresa May’s speeches at the Tory Party Conference did nothing to help my morale. I fear we are heading into very dark times and its a tad scary. I also have activities planned for later this month as well as our annual Christmas demonstration which will have a Charles Dickens theme this year. Please donate if you can. If you cant then please share this blog. ‘Encouraging’ words of ‘Wisdom’ placed above Jobcentre computers. Thursday’s weekly demo. The poor are not responsible for their own poverty.